The people who looks Jesus passing by the streets of Jerusalem revere him, calling him the blessed one who comes in the name of the Lord and put palms and leaves to honor his passage. In the letter to the Philippians Paul depicts the portrait of this king, of this blessed one, of this one sent in the name of the Lord. In the 2nd chapter of the letter –which is in fact a liturgical hymn - Jesus Christ is at the center of every word and feeling Paul evokes to his beloved community. He writes to the Philippians who are Christians and have, therefore, Christ as the prototype of human being and of true life. And the description Paul makes of Jesus in the second reading of this Palm Sunday is exactly the one of the humble and obedient servant. The Gospel – already announced at the beginning of liturgy - will go behind, before the glorious entrance in Jerusalem, to Bethany where Jesus, feeling death approaching, is together with disciples and friends. And a woman was there. Who is that woman? The tradition has sometimes interpreted and identified her with Mary of Bethany, Martha´s and Lazaro´s sister, who sat at Jesus‘feet, listening to his word. But the gospel only mentions “a woman”, who came with an alabaster jar of perfumed oil, costly and precious, and poured it on Jesus‘head. Jesus, the Son of man, never had a place to lay his head." (Luke 9, 58) This woman´s gesture anointed him as Servant and Messiah, and he accepted it, as prophetical anticipation of his Passover. The perfume and the essence of love poured out anointed him, and through him, the whole universe who will be able to smell it: full life who will come from the death freely accepted for the sake of the others. And this perfume will be remembered in memory of her who makes memory of Him. 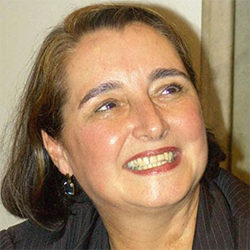 Maria Clara Lucchetti Bingemer is a Brazilian theologian and academic at the Pontifical Catholic University of Rio de Janeiro (PUC). Bingemer is an associate professor of Theology at PUC and has served as both the vice dean and dean of the Center of Theology and Human Sciences of the university, her alma mater. She has served in an advisory position with the Brazilian Catholic Bishops’ Conference, looking specifically at the role of women and married laity in the Church and civil society. Bingemer is also a leader in the Christian Life Communities program and serves on the boards of various theological journals and committees.